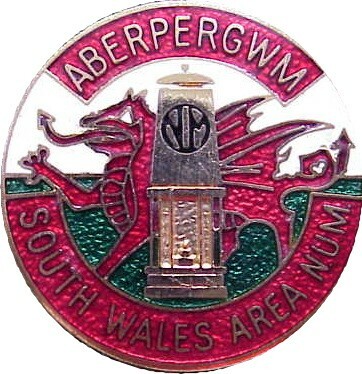 Badges, especially enamelled ones, are a very popular and commonly collected form of mining memorabilia. This is hardly surprising given the huge diversity of types known plus their usually colourful appearance. The number of mining badges so far recorded runs to about 2000 different examples. This number still increases slightly with each year that passes as new examples are rediscovered. 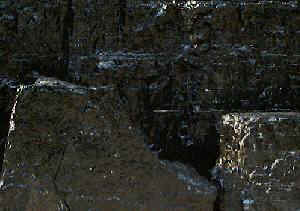 In the order of at least 95% of all known examples emanate from the coal mining industry but a few are known for Ironstone and metalliferous ore mining regions plus the oil shale mines of Scotland. 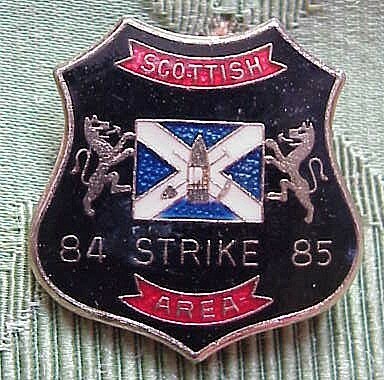 A Scottish 1984/85 Miners' strike badge plus a Welsh Area NUM Lodge membership badge. Lapel button hole fastening types - These comprise some of the earliest mining related badges and date from the early to mid 1900s. Pin Fastening types - These generally post date the button whole types and make up the vast majority of examples known. Stick pin or pin button types - These are less common types and usually comprise a small decorated enamelled motif on the end of a pin which would typically be worn on a lapel. Fobs - These are often early 1900s examples and would have been suspended from a chain as part of a watch fob set or similar. By far the vast majority of badges encountered are those issued by the various collieries plus Unions and action/support groups as part of the year long national miners' strike of 1984/85. The number of different examples known, including enamel colour variations, runs to between 900 and 1,100. A few similar badge examples are known from the 1992 campaign against pit closures plus the 1972 miners strike. 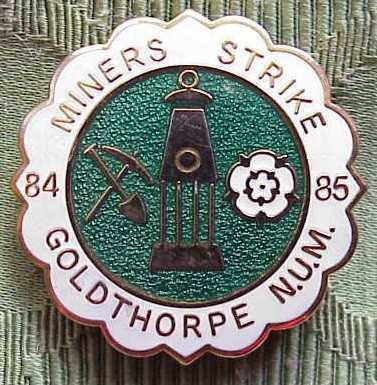 Goldthorpe Colliery NUM Miner's 1984/85 strike badge . A small selection of more unusual and none strike related mining badges.